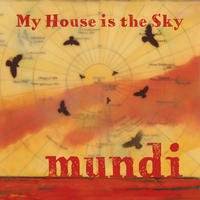 Mundi : My House is the Sky. Early music meets global folk at the penguin café. To enter the world of My House is the Sky is to enter a place of lyrical French horns, strings, Spanish guitars and drums. This is our fourth album, and while we continue to step back in time and connect with more ancient sounds, we also worked on crafting a more defined rock sound on some of the tracks. Also we felt it important to make it an album of contrasts, offering a sense of journey and exploration for listeners. There are the big sounds of 'The Gathering' and 'Sandansko Horo,' a little bit of comedy with 'The Bespectacled Bears Waltz,' and 'A Cup of Tea with Santiago,' and we finish the album with 'To Morocco with the Stars,' with desert winds, an Arabic oud, a typewriter and folk bass guitar that we bought during a visit to that country while on tour in Spain. License Early music meets global folk at the penguin café by Mundi for your project. Play the music of Mundi in your restaurant or store.